Eddie, a Jack Russell Terrier is a lucky dog. He gets to accompany his owner to work every day to the Mukwonago Industrial Park and hang out with the guys. 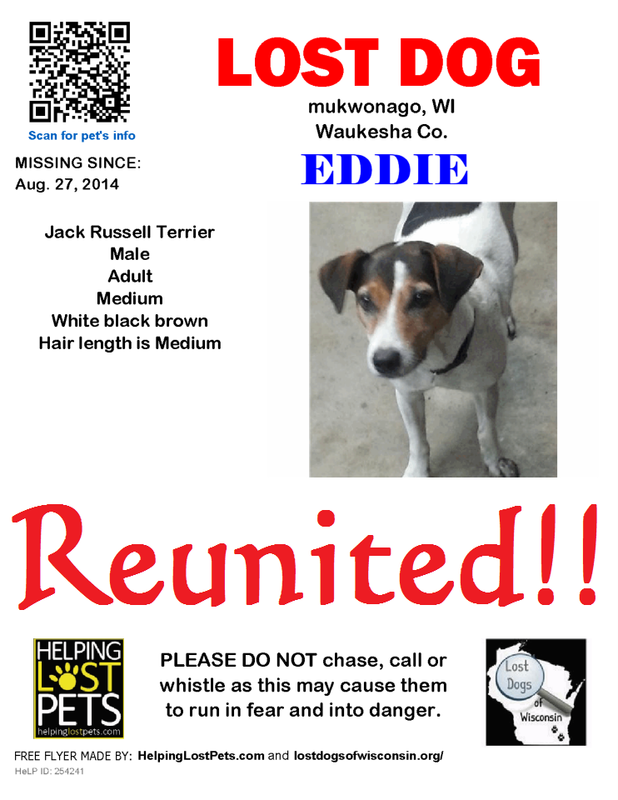 But on August 27th, Eddie went missing, and the search was on. Despite flyering and calling all of the authorities, Eddie seemed to have vanished into thin air. Fast forward eleven days to Brookfield Wisconsin. 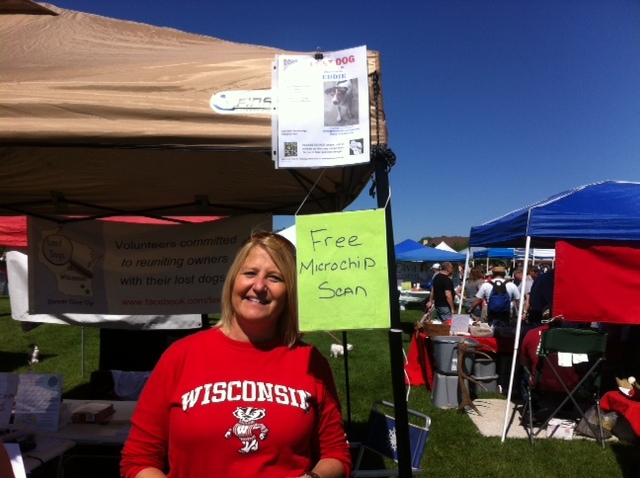 Lost Dogs of Wisconsin was attending a fundraising event for Elmbrook Humane Society called Wagfest. Thousands of dog lovers attend this outdoor event each year accompanied by their canine friends. We were doing free microchip scans and at times the line was long. People and dogs waited patiently for their turn. We had placed flyers of our “still missing” dogs on the legs of our pop-up tent in the hopes that people would take a minute to look at the pictures and see if they recognized any. One woman, Donna (pictured below), was waiting for her dog’s turn and suddenly announced that she knew where Eddie was. She pointed to his flyer and remembered that one of her coworkers had picked up Eddie while they were doing a paving job in Mukwonago. Eddie had actually jumped into the worker’s car and eaten his breakfast burrito! Eddie’s finder took good care of Eddie during the time he had him. Donna quickly made a few calls and confirmed that yes indeed it was Eddie and arrangements were made to get him back to his owner. The whole process took less than an hour. Eddie’s story had a wonderful ending. It is a good reminder that it doesn’t matter whether your dog is simply lost or has been picked up by a Good Samaritan; generating sightings through flyers and signs is the key to a successful recovery. All it takes is ONE call, ONE lead, ONE tip – to set the wheels in motion to get your lost dog back home. Keep flyering, and using signs and posters, until you get the ONE tip that you need. Never Give Up! Your missing dog is depending on you to bring him safely home. This entry was posted in Reunion Stories and tagged Flyering, Generating Sightings, Lost Dogs of Wisconsin, Reunion Stories, Signs. Bookmark the permalink.